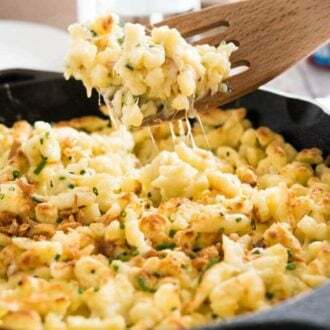 Cheese Spaetzle (Käsespätzle) is the German version of Mac and Cheese! Made with homemade German egg noodles and Emmental cheese. This Bavarian dish is special enough for an Oktoberfest party but so easy that you can make it every day! In a small bowl combine shredded Emmental cheese, heavy cream, and chopped chives. Heat up the butter in a 9-10-inch cast iron pan over medium heat. When the butter is hot add the spaetzle. Cook over medium-high heat until they're golden brown on the edges and slightly crispy. Add the cheese mixture and stir to combine. Put the pan under your broiler for about 2-3 minutes until the top gets golden brown. Garnish with chopped chives and crispy fried onions.